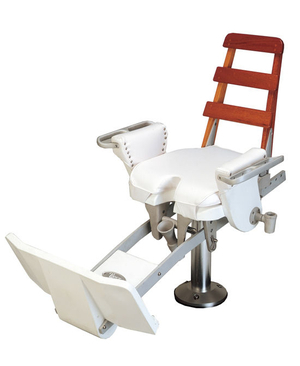 A fighting chair is a special kind of seat found in the cockpit of some sport-fishing boats. They provide safety and comfort to someone reeling in large game fish such as tuna and swordfish. These chairs are popular for big-game fishing on boats large enough to accommodate them. The chair is installed in the middle of the cockpit where there is enough room for it to rotate freely. The seat is often cushioned and features a comfortable back for bracing while working a catch. Certain models are equipped with footrests for optimum positioning and increased safety while landing very large fish. Chairs are generally adjustable to suit all builds. Some have armrests or amenities such as rod holders and fish wells. Choice will depend on the user's build. Verify that there is enough room in the cockpit for installation.